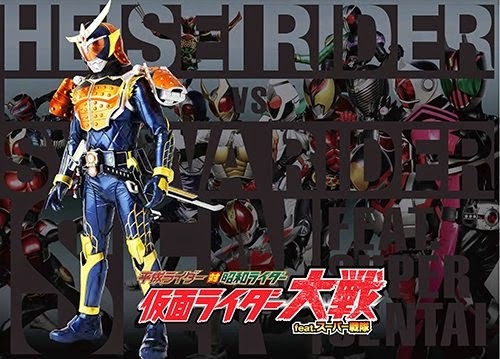 Here is a short intro of the film, Heisei Rider vs. Showa Rider: Kamen Rider Wars feat. Super Sentai. That premiered last March. The movie was opened at #3 in the Japanese box office on its first weekend. The video showcases multiple fights between Kabuto, Stronger, J, Fourze and Gaim. However loses turns into a lockseed. Directed by Takayuki Shibasaki (Chou Den-O Episode Yellow, Kamen Rider OOO Wonderful, Go-Busters VS Gokaiger), Heisei Rider vs. Showa Rider: Kamen Rider Wars feat. Super Sentai premiered last March 29th, 2014.